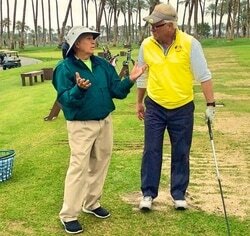 ​A "Full-Swing Clinic" for Intermediate and Advanced Golfers! less time on learning "how-to" skills. Within a few full-swings, you'll find your best focus and how to transition practice onto the course with ease. preparation, your anxiety level and ​overall mental focus when you have the tools to do so. Get ready for an entirely new way to practice and learn from it! Discover how to be more athletic! Appreciate how to practice purposefully and effortlessly. Learn the four keys to elevate your game to the next level. Receive handouts with drills and techniques to quiet your mind. Learn the four words that can get you prepared for every shot. ​Limited enrollment - $200 per-person for a group clinic, $250 for an individual lesson. Contact us at ​​​puttdoctor@msn.com for information about Focus Your Mind Workshops in your area. championship, his students won the championship flight and the A & B flights. ​the heart of their focus during the tournament."